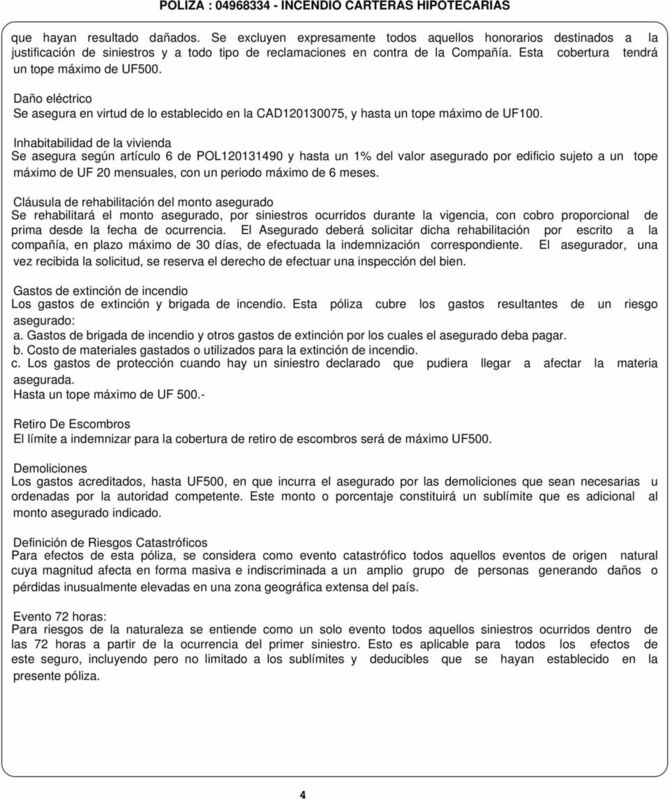 Download "POLIZA DE INCENDIO CARTERAS HIPOTECARIAS"
SVS INFORMA RESULTADO DE PRIMERA LICITACIÓN DE SEGUROS DE INCENDIO Y SISMO ASOCIADOS A CRÉDITOS HIPOTECARIOS ESTABLECIDOS POR LA LEY 20. 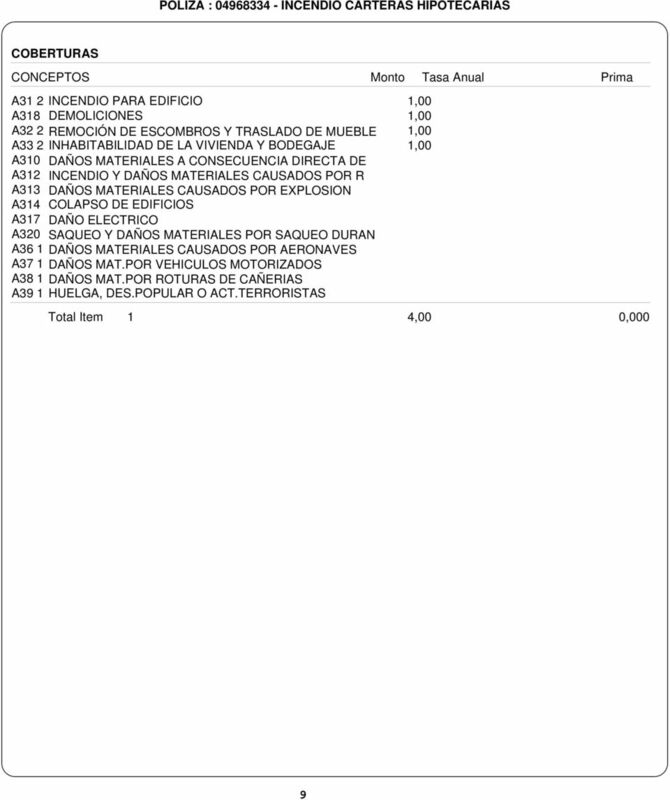 POLIZA DE RESPONSABILIDAD CIVIL NRO. 43064 ICB CORREDORES DE SEGUROS LTDA. 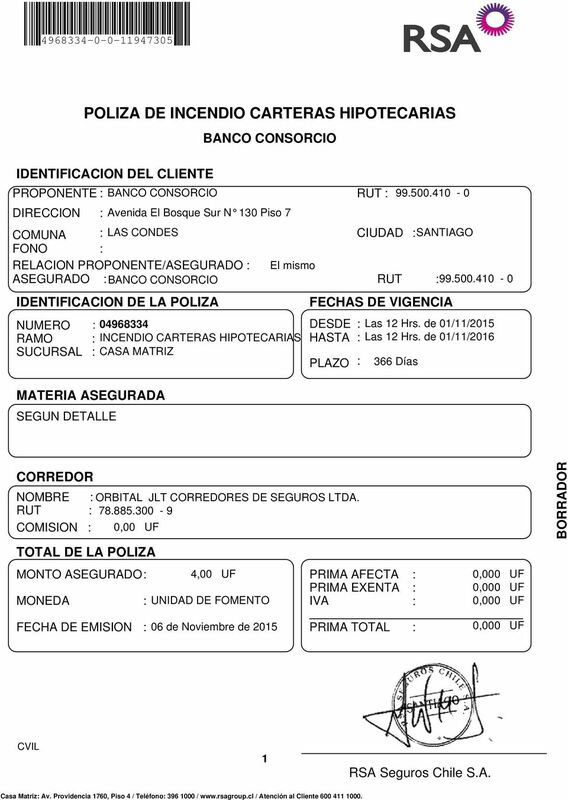 SEGURO COLECTIVO DE VIDA ESCOLARIDAD PÓLIZA N 5002448 CONDICIONES GENERALES REGISTRADAS EN EL DEPÓSITO DE PÓLIZAS DE LA SUPERINTENDENCIA DE VALORES Y SEGUROS BAJO LOS CÓDIGOS POL 220131058 Y CAD 220131086. 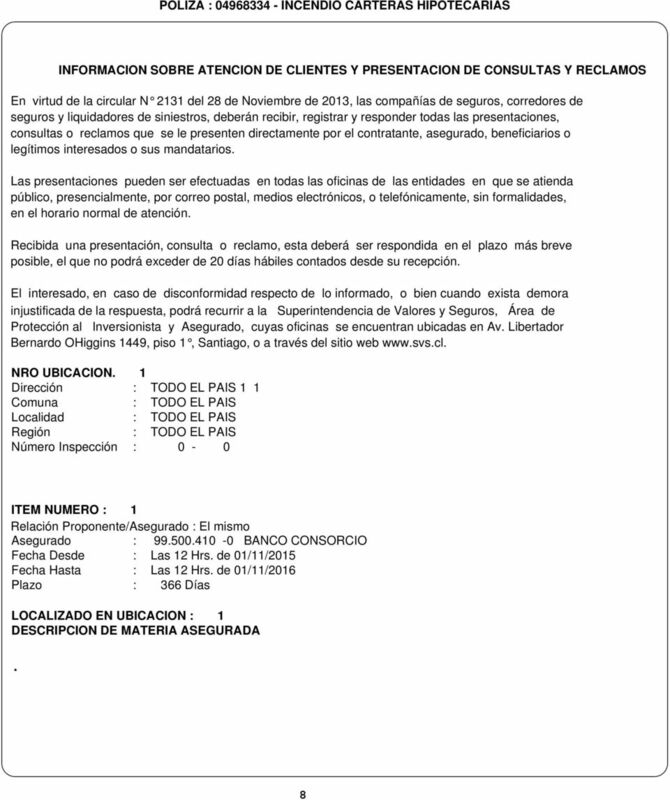 BASES DE LICITACION PUBLICA SEGURO DE DESGRAVAMEN E INVALIDEZ TOTAL Y PERMANENTE 2/3 CARTERA LEASING HABITACIONAL INMOBILIARIA PROHOGAR S.A.
POLIZA DE GARANTIA NRO. 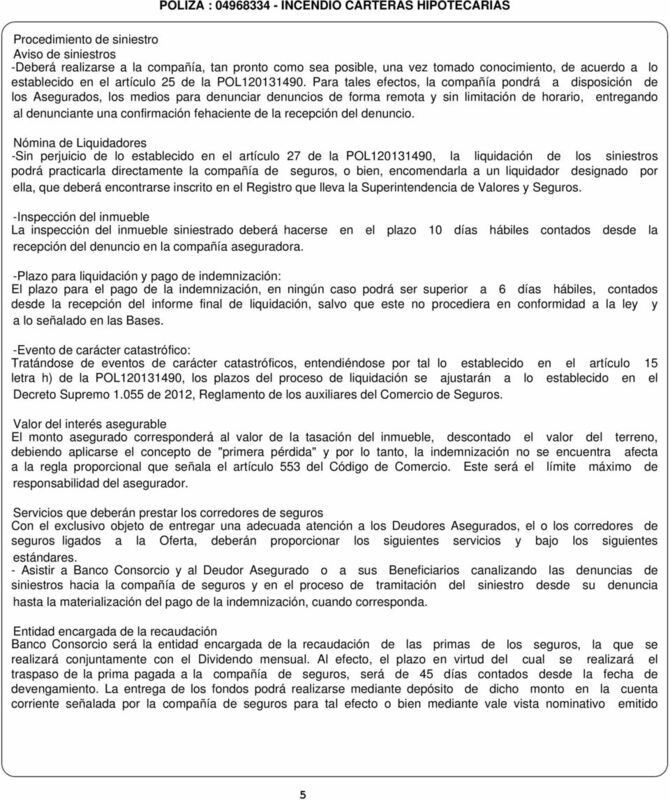 129520 ICB CORREDORES DE SEGUROS LTDA. 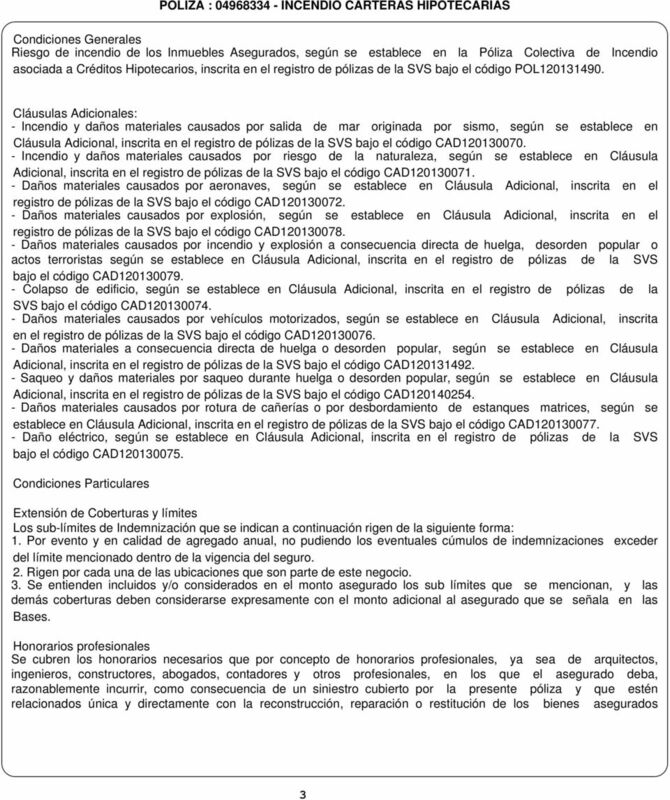 SEGURO COLECTIVO DE VIDA ESCOLARIDAD PÓLIZA N 5002794 CONDICIONES GENERALES REGISTRADAS EN EL DEPÓSITO DE PÓLIZAS DE LA SUPERINTENDENCIA DE VALORES Y SEGUROS BAJO LOS CÓDIGOS POL 220131058 Y CAD 220131086. 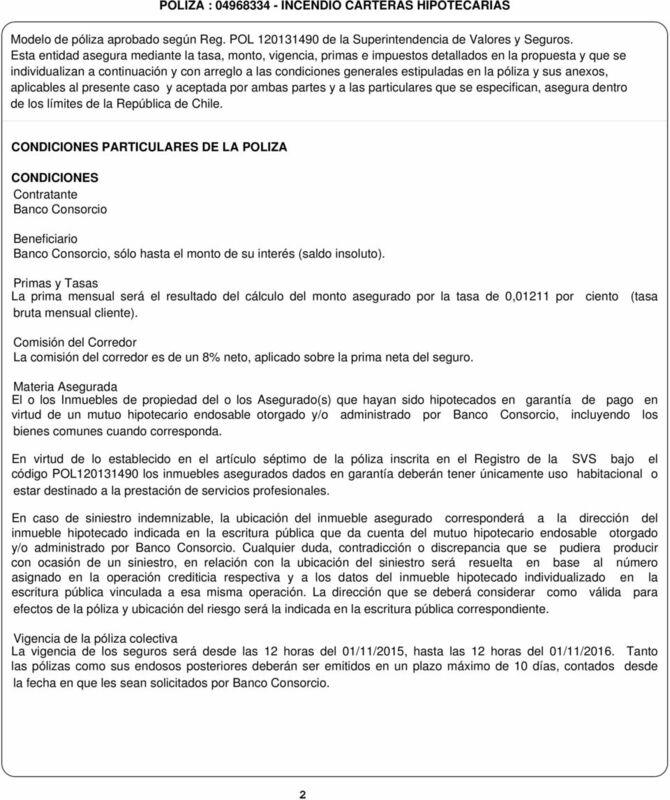 BASES DE LICITACION PÚBLICA SEGURO DE DESGRAVAMEN E INVALIDEZ TOTAL Y PERMANENTE 2/3 CARTERA HIPOTECARIO CCAF LA ARAUCANA. 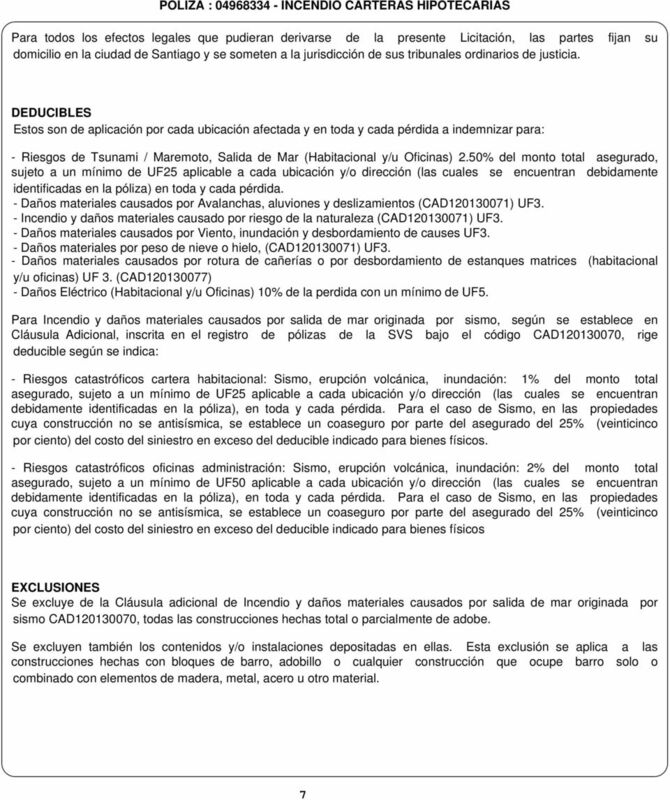 BASES DE LA PROMOCION VERANO SEGURO ENERO MARZO 2011 BCI SEGUROS GENERALES S.A.
CONTRATO DE SUSCRIPCIÓN DE CUOTAS FONDO MUTUO LARRAINVIAL AHORRO ESTRATÉGICO. Razón Social: LARRAÍN VIAL ADMINISTRADORA GENERAL DE FONDOS S.A. 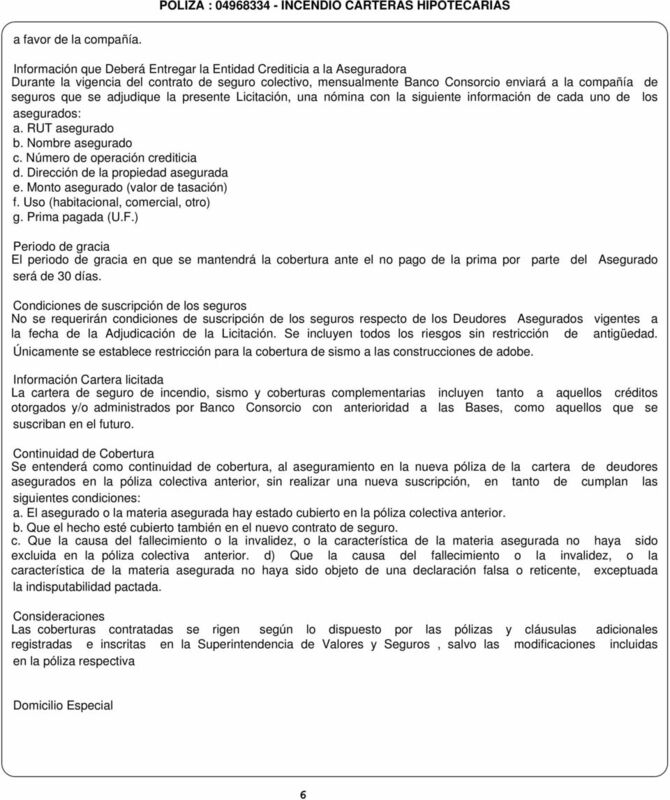 BASES DE LICITACION PÚBLICA SEGURO DE INCENDIO, SISMO Y ADICIONALES CARTERA LEASING HABITACIONAL INMOBILIARIA PROHOGAR S.A. BASES DE LA PROMOCION SEGURO HOGAR BCI PROMOCIÓN ENERO - MARZO 2009 BCI SEGUROS GENERALES S.A. BASES DE LA PROMOCION SEGURO HOGAR BCI PROMOCIÓN ENERO - ABRIL 2010 BCI SEGUROS GENERALES S.A.